Amazing Grace | Movie | Birth.Movies.Death. 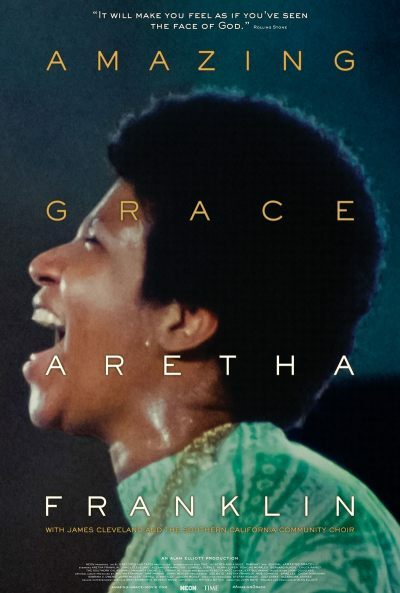 Aretha Franklin’s Amazing Grace is one of her most famous works: a soaring, beautiful album that went on to sell over 2 million copies, becoming the bestselling gospel record of all time. The whole thing was recorded live in a church over the course of two days, and luckily for all of us, legendary actor and filmmaker Sydney Pollack (THREE DAYS OF THE CONDOR) was there to capture it. But unluckily for Pollack, he and his crew made a major technical error. It turns out the crew never used a clapboard (those black-and-white striped sticks that they snap together before calling, “Action!”), which is used in editing to sync up picture and sound. So for the last four decades, this incredible footage capturing the recording of one of the greatest albums of all time has been unseen due to the gargantuan effort required to manually sync Pollack’s imagery with the audio of Franklin’s extraordinary voice. Thankfully, producer Alan Elliott was able to navigate all of that, along with some ongoing contractual disputes (seriously, this man has been striving to release this film for 29 years), so that we can all finally see this rousing, vibrant document of The Queen of Soul at the height of her powers.